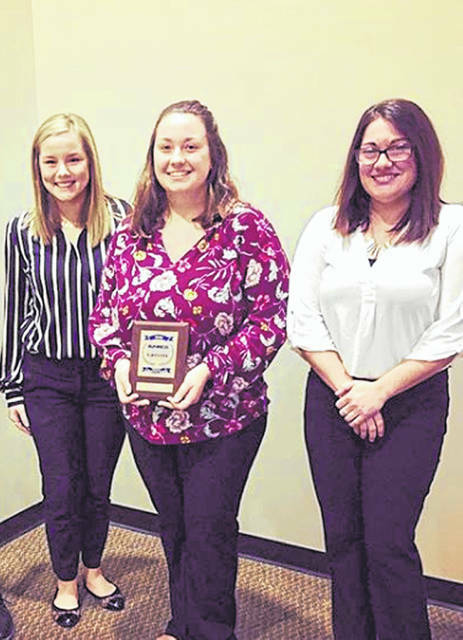 The Global Marketing team, consisting of, from left, Mallory Case (North Union), Olivia Thallman (Marysville) and Cambryia Elkins (Bellefontaine), placed first at the BPA Regional Competition. LIMA – Nine students enrolled in the Ohio Hi-Point Multimedia Marketing program advanced to the BPA State Leadership Conference after competing at the Regional Competition in January. Ethan Edwards (Urbana), Shawn Stump (Urbana), Trevor Vanhoose (Indian Lake), and Trent Devine (Indian Lake) placed first in Video Production. Ondrea Bryant (Benjamin Logan) placed first in Prepared Speech. Kiarra Coats (Benjamin Logan) placed first in Presentation and Management (individual), and Mallory Case (North Union), Oliva Thallman (Marysville), Cambryia Elkins (Bellefontaine) placed first in Global Marketing. Dunn, Berg, Huff, and Shoffner will compete at the BPA State Leadership Conference in March in Columbus.